This project summary was prepared under contract between the U.S. Department of Health and Human Services, Office of the Assistant Secretary for Planning and Evaluation, Office of Disability, Aging and Long-Term Care Policy (DALTCP) and Apelon, Inc. For additional information on this subject, you can visit the ASPE home page at http://aspe.hhs.gov or contact the ASPE Project Officer, Jennie Harvell, at HHS/ASPE/DALTCP, Room 424E, H.H. Humphrey Building, 200 Independence Avenue, S.W., Washington, D.C. 20201, Jennie.Harvell@hhs.gov. The President and the Secretary of Health and Human Services (HHS) have made the implementation of interoperable health information technology (HIT) a priority. Fully useful interoperation will require content standards and messaging standards. Consolidated Health Informatics (CHI -- an inter-agency federal task force) recommended the use of terminology and messaging standards to standardize the Federal Government's collection, analysis, and exchange of health information. HHS collects information regarding the health and functional status of Americans. Included in this collection is the nursing home Minimum Data Set (MDS). MDS data is used by the Federal Government to create: (i) payment rates for Medicare skilled nursing facilities, and (ii) quality measures and quality indicators for Medicare and Medicaid nursing facilities. Jointly managed by the HHS Assistant Secretary for Planning and Evaluation and the Centers for Medicare and Medicaid Services (CMS), this project will: (i) "standardize" a sample of MDS items, and (ii) using this experience develop, implement, and analyze a strategy and a software system to operationalize the CHI recommendations for many of the MDS data elements. Nursing homes are required to conduct resident assessments using the MDS. The statute requires that the MDS assessments be used for care planning, and, over time, the use of the MDS has expanded to include its use in nursing home payment and quality measurement. CMS developed the MDS form about 15 years ago, and it reflects the limitations of the technology in place at that time. Since the MDS was first implemented, research has found that the MDS does not always capture information needed to support caregiving nor that needed to measure quality. CMS is working to enhance the clinical content of the MDS. 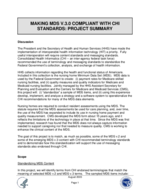 The goal of this project is to match, as much as possible, some of the MDS v.2 and some of the emerging MDS v.3 content with CHI recommended terminology standards and to demonstrate how this standardization will support the use of messaging standards also endorsed through CHI. The primary candidate CHI vocabularies included in this analysis are: SNOMED-CT, RxNorm, and HL7. A database will be created to contain all sampled MDS terms and associated definitions. The database will link to targeted CHI vocabularies. The relevant CHI vocabularies will be searched and potentially matching standardized terms will be identified. The database will support a user interface that presents: (i) each MDS term, associated definitions, and uses; and (ii) potential standard matching concepts, any concept associations, and other information. We will create a review process by which interim experts will: (i) initially consider and refine the list of potential standard matches, and (ii) comment about the adequacy of the match with the selected MDS item. Matching results include: exact matches, partial matches, and "no match." When the result is either a partial match or no match, terminology and MDS experts will collaborate to offer guidance on: (i) how the MDS item could be modified to increase the likelihood of a better match; (ii) whether the MDS item should be deleted; or (iii) whether the targeted standard vocabulary should be extended. Review by clinical domain experts will also be undertaken to confirm the clinical appropriateness of selected matches and the recommendations for MDS modification. Based on these results, the government will select the standard terms to be used with future versions of the MDS. Following the terminology analysis, the project will demonstrate the use of electronic messaging standards (using HL7 v.2 messages as recommended by CHI) to transmit standard MDS content from providers to HHS. The types of messages that will be constructed include those related to payment and quality indicators and measures. messages that were constructed and how the standard content and message format supports the needed information exchange and, more generally, the desired interoperation. The final report also will describe the methods developed and used to: (i) analyze and identify standard matching terminology for selected MDS terms, and (ii) construct HL7 messages to exchange information between nursing homes and the Federal Government. The final report will evaluate these methods (including the specialized terminology software tools used for the construction of the database) for re-use in standardizing additional MDS items and other federally required health and functional assessment tools (i.e., OASIS, IRF-PAI, and other federally required patient data collection tools). This project is funded under contract between the U.S. Department of Health and Human Services, Office of the Assistant Secretary for Planning and Evaluation, Office of Disability, Aging and Long-Term Care Policy (DALTCP) and Apelon, Inc. For additional information on this subject, you can visit the ASPE home page at http://aspe.hhs.gov, the DALTCP home page at http://aspe.hhs.gov/_/office_specific/daltcp.cfm or contact the ASPE Project Officer, Jennie Harvell, at HHS/ASPE/DALTCP, Room 424E, H.H. Humphrey Building, 200 Independence Avenue, S.W., Washington, D.C. 20201, Jennie.Harvell@hhs.gov.